This post is sponsored by US Family Guide, but as always, all opinions are 100% mine. Do you have a Junior Golfer at home? Kids ages 7-17 of all ability levels can attend summer golf camp and we have a promo code to save $50 off! There are full and half day programs available at more than 25 locations all across the USA. It’s Not Just Any Golf Camp – It’s the PGA Junior Golf Camps. 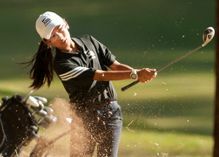 New this summer, juniors can now learn from the leaders in golf instruction – the PGA of America. With programs designed for beginners through advanced players, each camp is taught in a nurturing, safe, and supportive environment where the emphasis is placed on kids having FUN! Enroll today to save up to $50 off the price of camp and receive a free golf cap ($25 value) by using coupon code USFAM15. Register at www.pgajuniorgolfcamps.com. Not sure which summer camp to choose? read How to Pick a Summer Camp.